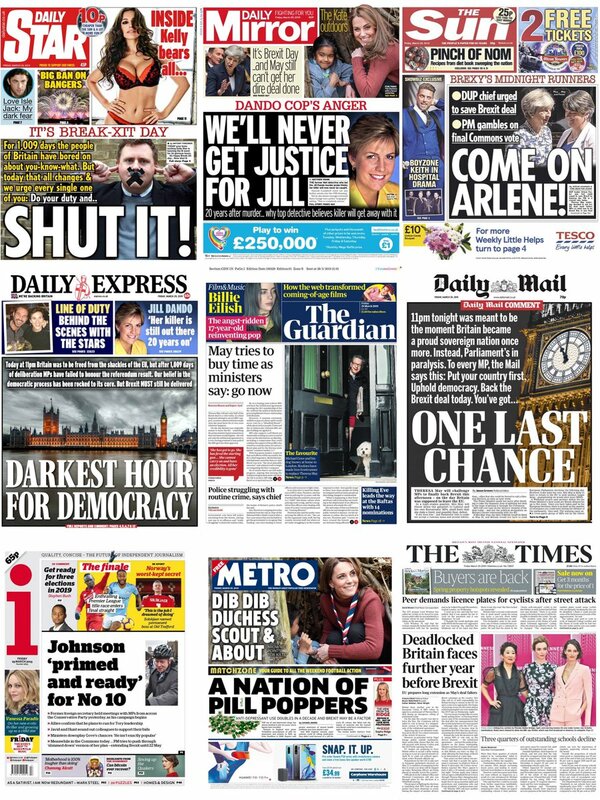 It maybe Easter but there is no escaping the newsquiz. So grab yourself a hot cross bun and test your knowledge of the week’s events. Last week’s top solo scorers were Tom Savage and Janet Boyle, both with 19. Toby Brown scored 18 and Sian Brewis, The Sub Editor (I know who you are) and Dave Bromage all scored 17. Bruce and Sarah Hayward, with a PB 21, were the top team. Ellie Rewcastle, with help from a couple of Telegraph subbing colleagues, got 20. Here’s this week’s quiz, as usual 25 questions about the week. Give it a go and let me know how you get on. 1. In a live presidential broadcast Emmanuel Macron vowed to rebuild the cathedral of Notre Dame 'even more beautiful than it was’ in how many years? 2. Different editions of a novel by which writer held the first, third, fifth, seventh and eighth slots in Amazon France’s bestseller list this week? 3. 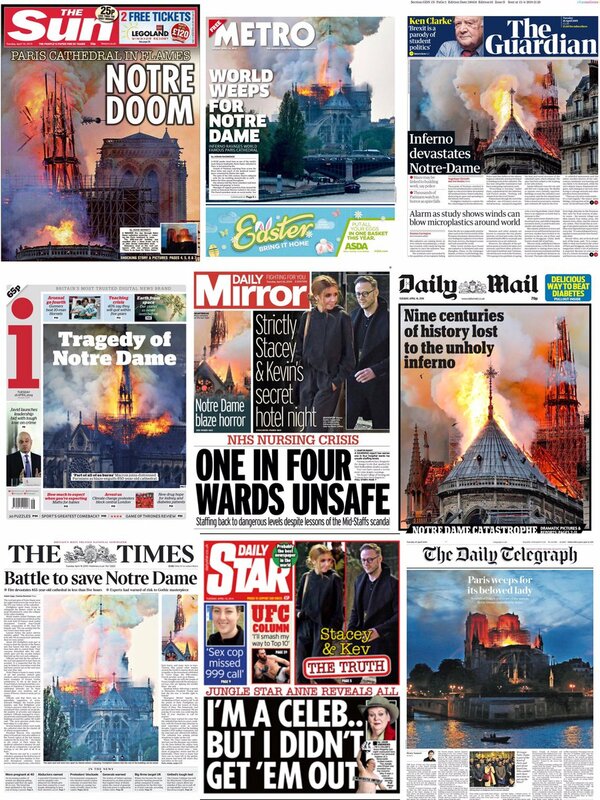 Around 180,000 what are housed on the roof of the cathedral of Notre Dame and ‘miraculously’ survived the fire? 4. Who was ’not planning to run’ for Prime Minister but has ‘kept the door slightly ajar’? 5. 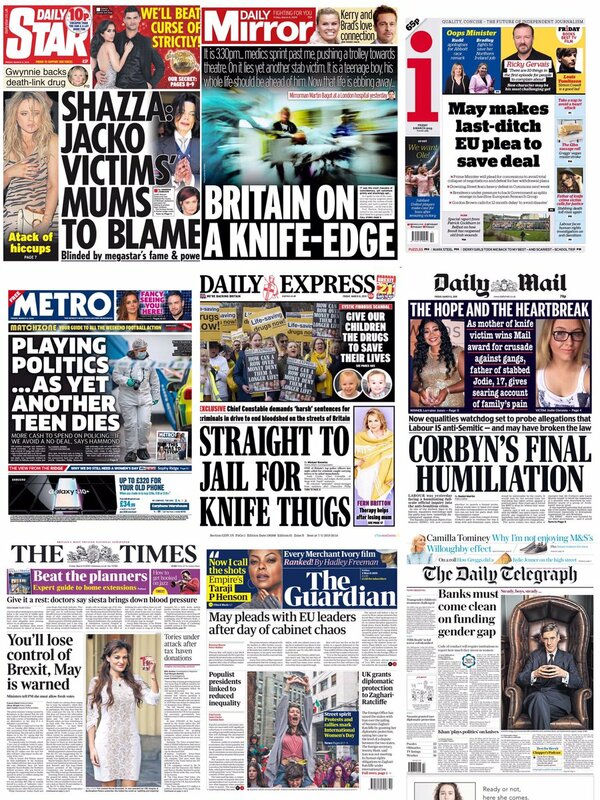 Home Secretary Sajid David said he could easily have fallen into a life of crime as he ‘grew up on what was once tabloid-dubbed Britain’s most dangerous street’? The street he was referring to was Stapleton Road in which city? 6. UKIP candidate Carl Benjamin, at the launch of the party’s European election campaign, refused to apologise for a tweet that said he 'wouldn’t even ____' Labour MP Jess Phillips. What is the missing word? 7. Who said this week: 'To have my kids there, it's come full circle. My dad was here in 1997 and now I'm the dad with two kids there’? 8. Eco-protesters were arrested after gluing themselves to the door, smashing windows, spraying graffifi on the walls and sloshing oil on the buildings of which company's London HQ? 9. What was the name of the 29-year-old journalist who was shot dead in riots in Derry? 10. According to the Mueller report, when Attorney General Jeff Sessions told Donald Trump that a Special Counsel had been appointed, the President slumped back in his chair and said: ‘Oh my God. This is terrible. This is the end of my ____.’ What is the missing word? 11. Why was 15-year-old Daniel Hegarty back in the headlines? 12. Millionaire landlord Paul Bussetti is to appear at Westminster magistrates court after posting a video of what last November? 13. At least 29 people, killed in a bus accident on the Portuguese island of Madeira, were tourists from which country? 14. Actor Bradley Welsh, who played gangster Mr Doyle in the second Trainspotting movie, was shot dead in which city? 15. Professional footballers are boycotting social media for 24 hours starting today (Friday) in a bid to highlight racism. What is the campaign called? 16. Nine-year-old Frankie Macritchie was killed by a dog while on holiday at a holiday park in which seaside town? 17. Which healthcare group was fined £300,000 over the death of 14-year-old Amy El-Keria at a hospital in East Sussex? 18. Which bank became the first to promise compensation to all victims of fraud? 19. Actress Mya-Lecia Naylor, who appeared in TV shows Almost Never and Mille Inbetween and in films including Absolutely Fabulous and Cloud Atlas, died this week. How old was she? 20. Who said she was ‘lucky to be alive’ after fleeing barefoot in her pyjamas after a fire broke out in her London home? 21. British teachers Milly and Toby Savill were killed when they accidentally reversed their buggy over a ravine's edge on which Greek island? 22. Which actress has revealed she is raising her seven-year-old as a girl - after introducing the child to the world as a boy? 23. Spurs beat Manchester City in a seven-goal Champions League match to set up a semi-final against which team? 24. Who took to Twitter to say: 'Anyone with any adult life experience knows there are two sides to every story. I haven't got the time or energy to correct some of the utter nonsense I've read on here’? 25. Why did 192,000 people stay up until after 2am on Monday? 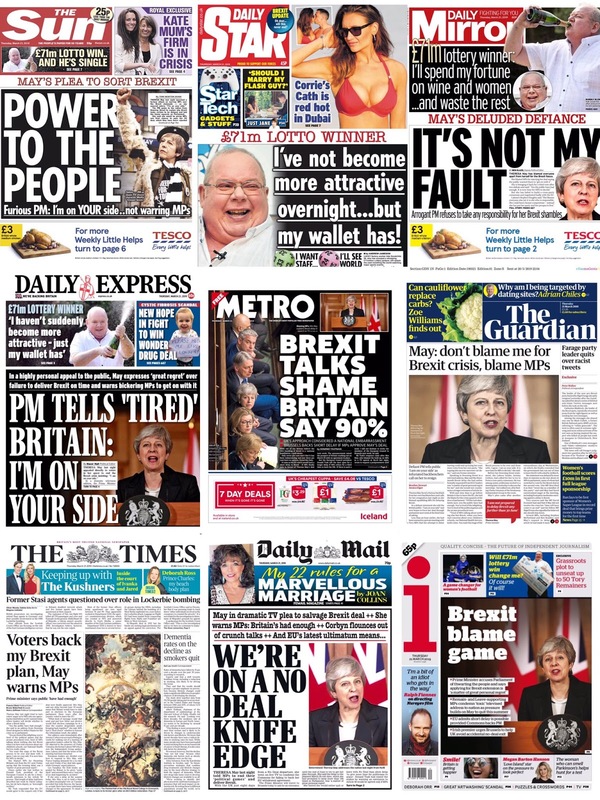 There were some strong scores in last week’s newsquiz. The joint top solo scorers were Jemma Carr and Ellie Rewcastle with 19.5, narrowly ahead of Janet Boyle and Adam Shergold on 18.5, Steve Silk on 18 and Jaymes Bryla on 17. The extended Penman/Thompson Clan were the top team with 21. Here is this week’s quiz. As usual there are 25 questions about the week’s events. Give it a go and let me know how you get on. 1. The EU agreed to which date as the new deadline for Brexit? 2. Chancellor Philip Hammond said: 'We spent ____ so far on preparing for Brexit, but that is not just for a no-deal Brexit - much of that money would need to be spent anyway, putting in place systems to replace EU systems that we've been using up to now.’ What is the missing figure? 3. MPs were told by the leader of the House of Commons Andrea Leadsom that they would get an Easter holiday of how many days? 4. In which city did Nigel Farage launch his new Brexit Party? 5. Jacob Rees-Mogg’s sister, a 40-year-old former Telegraph journalist who has twice failed to get elected as a Tory MP, was introduced by Nigel Farage as a candidate for his new party. What is her name? 6. 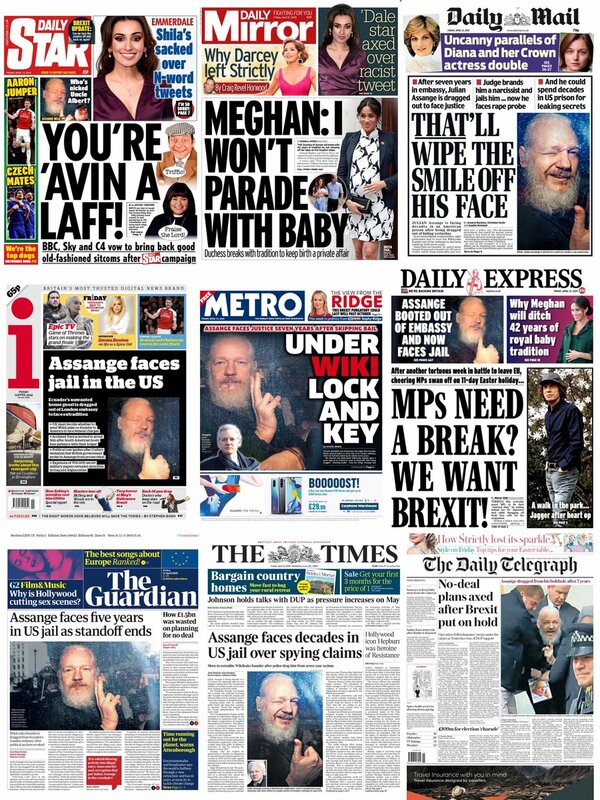 WikiLeaks founder Julian Assange was arrested in London after being dragged from the Ecuadorian embassy where he had been since what year? 7. Why were Virgin and partner Stagecoach blocked from three rail franchises by the Department for Transport? 8. Debenhams shares were suspended from trading and the chain went into administration after it turned down a £200million rescue proposal from who? 9. A spacecraft called Beresheet from which country crash-landed on the moon? 10. What law came into force today (Friday) after a high-profile campaign led by 27-year-old writer Gina Martin? 11. Laleh Shahravesh was fined 3,000 UAE dollars (£624) in Dubai after calling her ex-husband’s wife what in a Facebook post? 12. Why was 29-year-old Dr Katie Bouman in the headlines? 13. Rugby Australia has terminated its contract with Israel Folau after he said what awaited gay people? 14. Jack Shepherd faced an Old Bailey judge who gave him a six-month sentence for what - on top of the six years for the manslaughter of 24-year-old Charlotte Brown? 15. In elections held this week Benjamin Netanyahu was on course to become Israel’s Prime Minister for a record number of times. How many? 16. The fatal accident inquiry into the Clutha helicopter crash in Glasgow in 2013 heard how each of the victims died. 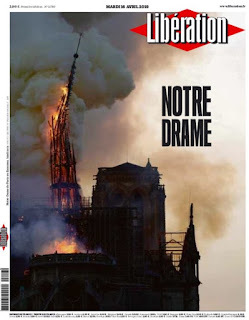 How many people lost their lives? 17. Who quit after seven years in the job, saying: 'I am not leaving because of any upset or disagreement at all, I am just stepping away to give more focus to my many other commitments.’? 18. Football pundit Gordon Strachan was dropped by Sky Sports for making remarks that likened racist abuse to what? 19. Which project bought John Bishop's home for £6.8million despite the comedian previously criticising it? 20. The ULEZ came into force in Central London this week. What do the initials stand for? 21. James Cracknell became the oldest person to compete in the Cambridge-Oxford-boat race. How old is he? 22. Why did television presenter Tess Daly say she was 'devastated' adding that 'this has, and continues to be, a very emotional time for us all'? 23. Which school won David Walliam’s Golden buzzer in the first show of the new series of Britain's Got Talent? 24. Why was actress Shila Iqbal sacked from TV soap Emmerdale? 25. Fawlty Towers was named the 'greatest ever British sitcom' by a team of comedy experts. Which sitcom came second? 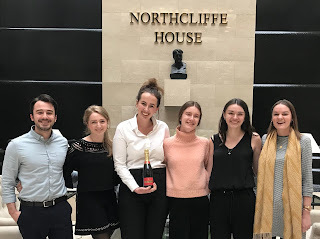 The MailOnline trainees enjoyed their final training week in Kensington with sessions by showbiz editor Louise Saunders, social media editor Chris Lawrence, Natalie Glanvill from the managing editor’s office and final interviews with Sue Ryan. They also had a quick Q&A with former trainee Faima Bakar. Some of the stories that the trainees pitched and wrote were also published. You can read Jemma Carr’s Femail story on ridiculous hacks, such as making sandals out of sanitary pads, here. 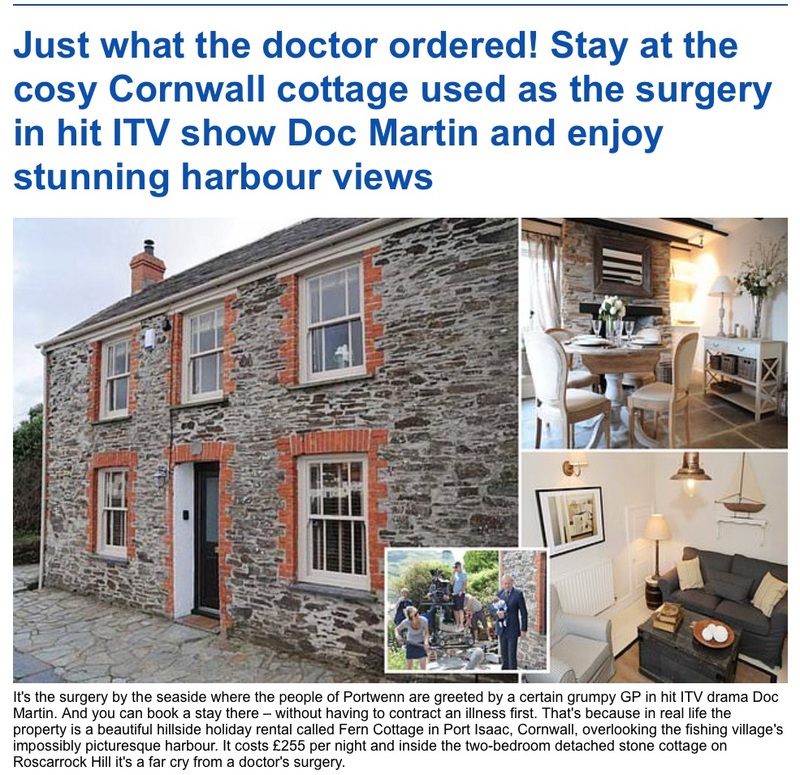 Emily Webber found out that, as the ninth series of Doc Martin begins filming in Cornwall, you can stay in his surgery for £255 a night. Read her travel story here. Phoebe Eckersley interviewed Michael Jackson’s Number 1 impersonator to see what impact the Leaving Neverland documentary has had on his forthcoming tour. You can read it here. They have submitted other stories which will hopefully be published soon. Last night they had farewell drinks with the senior staff at the Greyhound. They are off on placement now and will return to the Mail in July. They are a bright and likeable bunch. I wish them well. 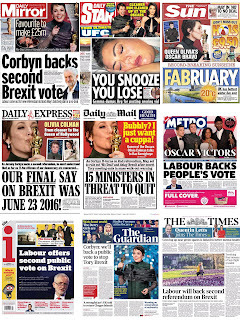 We finished the course, as always, with the newsquiz. Well done Jemma who scored an impressive 19.5 and collected the champagne for the highest score over the four weeks. She narrowly beat Emily who scored 17. The best solo scores in last week’s quiz were Janet Boyle with 16, Gavin Devine and David Saunders who both scored 15 and 14.5 by Steve Silk and Kieran Corcoron. The best teams were Bruce and Sarah Hayward with 19.5 and the Penmans with 17.5. Here is this week’s quiz. As usual there are 15 questions about the week’s events. Give it a go and see if you can beat Jemma’s 19.5. 1. The vote to delay Brexit, a proposal drawn up by Labour MP Yvette Cooper, passed through the Commons by how many votes? 2. Nigel Adams, a Government whip and under-secretary of state for Wales, quit in protest at Theresa May’s Brexit talks with Labour leader Jeremy Corbyn saying she was trying to 'cook up a deal with a ____' What is the missing word? 3. Two shadow cabinet members represented Labour in the cross-party talks on Brexit. Name both of them. Half point for each. 4. Why did more than 2,000 people complain about Channel 4’s coverage of the pro-Brexit rally? 5. Former Attorney General Dominic Grieve is facing deselection by his party after losing a confidence vote in which constituency? 6. 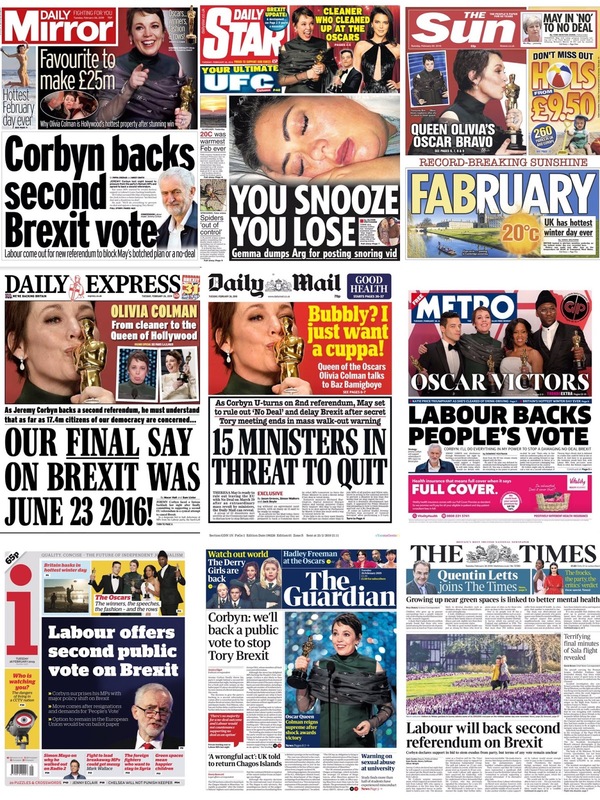 Which prominent Cabinet minister said a public vote to approve any final deal was 'a perfectly credible proposition’? 7. What was the name of the group of half-naked activists protesting about climate change which invaded Parliament on Monday? 8. What did illusionist Uri Geller claim to have bent as part of his attempt to stop Brexit? 9. An Army investigation was launched after a video showed British paratroopers doing what in Kabul? 10. Film star George Clooney called for a boycott of nine hotels because of their links to which country? 11. Why did driving instructor and Reading FC fan Kevin Keiley say he was flattered but annoyed with Instagram? 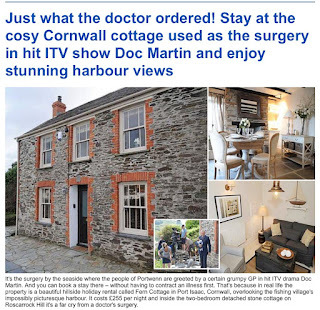 12. Who said on TV: 'Things to do with your bowels and poo ... are not things people normally want to talk about. But actually it's part of all our lives and you need to work on it’? 13. England and Everton goalkeeper Jordan Pickford was involved in a pub brawl in which city at the weekend? 14. Pub chain Samuel Smith has banned what from its 300 pubs? 15. Blue Planet Live's executive producer Roger Webb said ‘it's not for us to interfere’ after the BBC received complaints for showing what? 16. Name the woman who became the third richest in the world following her divorce from husband Jeff. 17. Who did Brian Rini claim to be when he was found wandering the streets in Newport, Kentucky? 18. 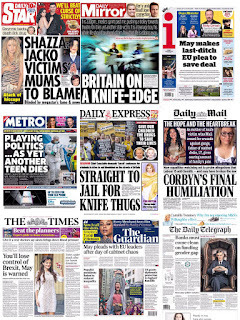 Jason Kakaire, 29, appeared at Highbury Corner Magistrates' Court accused of attempting to kill how many people in four days in Edmonton, North London, by stabbing them in the back? 19. JK Rowling’s former personal assistant Amanda Donaldson was ordered to repay how much (to the nearest £1,000) that she stole and spent on chocolates, perfume and two cats? 20. Who had an aortic valve replaced at the Presbyterian Hospital in Manhattan? 21. Who said: 'I will be more mindful and respectful of people's personal space’? 22. Prince Harry said this week: 'That game shouldn't be allowed. Where is the benefit of having it in your household? It's created to addict, an addiction to keep you in front of a computer for as long as possible.’ What game was he referring to? 23. Why did England manager Gareth Southgate, who said he would not wear a waistcoat again after the World Cup, change his mind to wear one this week? 24. Who said: 'After three Baftas and one Emmy... finally we have won an Oscar, please welcome Oscar James’? 25. Blue Peter has its tenth new dog. What is his name? The MailOnline trainees pitched stories to assistant Femail editor Steph Linning and travel editor Ted Thornhill this week. Some have been written and are awaiting publication. The trainees also had sessions with senior journalists Mark Duell and Chris Pleasance and recent trainee Tim Stickings. 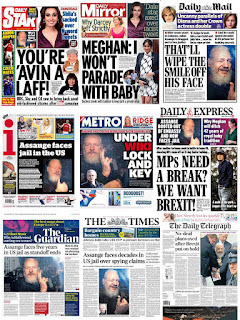 There was a run through the editor’s code and IPSO with Editor Emeritus Peter Wright. They also took a brief cake break to celebrate John Bennett's birthday. John had another reason to celebrate ... he won the video headline of the week. 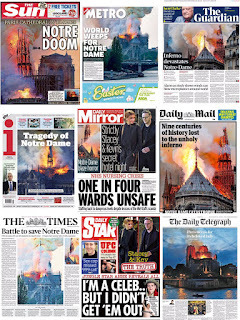 We finished the week, as always, with the newsquiz. The trainees all reckoned it was a toughie and, for the first time this course, none of them reached double figures. The top scorer with 9.5 was Jemma Carr. Last week's top online scorer was Toby Brown with a score of 21, just ahead of Janet Boyle on 18. The top team was the Roberts family with 19. Here is this week's quiz. As usual there are 25 questions about the week's events. Give it a go and see if you think it's a tough one. 1. Which former Tory minister succeeded in getting the Commons to back his call for eight indicative votes on Brexit? 3. Which of the eight Brexit options that MPs voted for on Wednesday received 268 Yes votes, more than any of the others? 4. 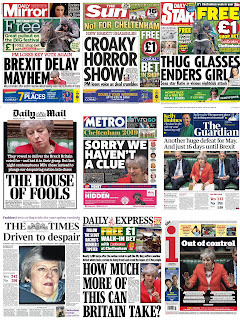 160 MPs voted for No Deal in the eight options. How many voted against? 5. Writing in the Daily Mail, Jacob-Rees Mogg said he was willing to support Theresa May’s Brexit plan on one condition. What was the condition? 6. Former Foreign Secretary Boris Johnson told Theresa May to 'channel the spirit' of which Biblical character as he argued she should embrace a no-deal scenario? 7. The Independent Group of defecting MPs, under the interim leadership of Heidi Allen, registered as a full-blown political party called what? 8. Uri Geller wrote to Theresa May saying: 'I love you very much but I will not allow you to lead Britain into Brexit. As much as I admire you, I will stop you ____ from doing this and believe me I am capable of executing it.’ What is the missing word? 9. All charges against The Empire actor Jussie Smollett, who was accused of arranging a fake racist and homophobic attack on himself, were dropped by a court in which US city? 10. What was the name of the cruise ship, carrying more than 1,300 passengers, that got into trouble in stormy seas off Norway? 11. Vatican spokesman Alessandro Gisotti explained why Pope Francis discouraged people from kissing his ring, saying: 'The Holy Father told me that the motivation was very simple: ____’ What is the missing word? 12. A British Airways plane, which mistakenly flew passengers to Edinburgh instead of Düsseldorf, left from which airport? 13. Wow Air, which stopped all flights and stranded thousands of passengers, is an airline from which country? 14. Rockland County in New York state banned anyone under 18 from all public places if they did not have what? 15. England football manager Gareth Southgate said his players encountered ‘unacceptable’ racist abuse in their 5-1 win against which country? 16. Ranking Roger Charlery, who died age 56, was a vocalist with which 1980s band? 17. Florida Senator Rick Scott called for what to be cancelled, saying it 'provides unwarranted legitimacy to a dictatorship with a decades-long history of persecuting and imprisoning its defectors and repressing its people’? 18. Following the report by Special Counsel Robert Mueller that neither Donald Trump nor his aides colluded with the Russians in the 2016 election, the president tweeted: 'No Collusion, No Obstruction, Complete and Total ____. Keep America Great!’ What is the missing word? 19. Ole Gunnar Solskjaer was given the full-time job of managing Manchester United this week after winning how many of his 19 games in charge as caretaker? 20. Both members of which Liverpool band died while travelling to a gig in California? 21. Which department store chain agreed a £200million refinancing deal which offered 'reassurance for employees, pension holders, suppliers and lenders’? 22. Labour peer and fertility specialist Prof Robert Winston called for all bikes to have what after he was kicked and abused for challenging a woman cycling on the pavement? 23. Who said of whom this week: 'She's going to hate me for this because she's all posh in her country house with her husband?’ Half a point for each name? 24. Which television series received 14 Bafta nominations? 25. Why was opera singer Anna Patalong asked to change the dress she wore during her Royal Albert Hall concert? 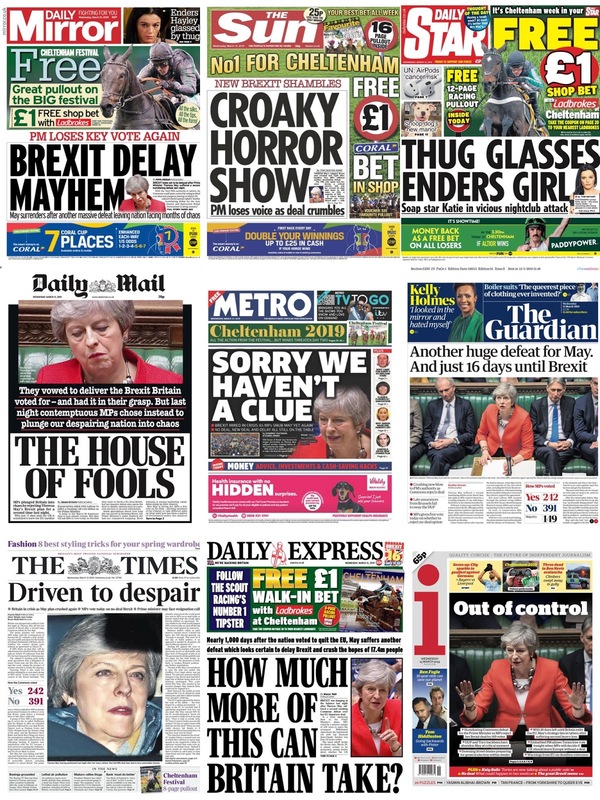 There were some first rate scores in last week's newsquiz with lots of you claiming personal bests and others saying it was easier than usual. Pick of the bunch was Gaby Mansell with a record-breaking 24. Toby Brown and Liz Gerard both scored 22, Damon Wake 21, Steve Silk 19.5 and Alan Geere 19. The best team score was the Roberts Family with 21. Bruce and Sarah Hayward scored 19, as did Adam Batstone and Lucy Thorpe. A special mention goes to Ian McCulloch who religiously posts his score - usually single figures - who celebrated a PB of 16. Here is this week's quiz, as usual 25 questions about the week's events. Give it a go and let me know how you get on. It may be a bit trickier this week. 1. What was the name of the 17-year-old girl who was stabbed to death in a park in east London? 2. A 17-year-old boy, Yousef Ghaleb Makki, was stabbed to death in Hale Barns, a village near which town? 3. Home Secretary Sayid Javid said knife crime should be treated ‘like a ____’. What is the missing word? 5. MP Anne-Marie Trevelyan said there would 'literally be rioting in the streets’ in her constituency if there was a second referendum on Brexit. Which town does she represent? 6. BMW warned that production of which car at Cowley in Oxfordshire may be at risk if there is a no-deal Brexit? 7. Paula Sherriff, the Labour MP for Dewsbury, was ticked off by the speaker for shouting what two words at Transport Secretary Chris Grayling? 8. Council tax bills in England will increase by an average of what per cent from April, according to the Chartered Institute of Public Finance and Accountancy? 9. Andrew Hill, 54, whose Hawker Hunter jet ploughed into the A27 in West Sussex, was cleared of how many counts of manslaughter at the Old Bailey? 10. The US ambassador to Britain, Woody Johnson, said the American process of using what to wash chicken was the same as that used by EU farmers to treat fruit and vegetables? 11. John Murphy was charged with assault after hitting Labour Party leader Jeremy Corbyn on the head with what during a visit to a north London mosque? 12. Northern Ireland secretary Karen Bradley faced calls to resign after saying those in the military and police who killed people during The Troubles were 'fulfilling their duty in a ____ and ____ way.’ What are the two missing words? Half a point for each. 13. Keith Flint, who died age 49, led the Prodigy to their first UK Number One single in 1996. What was it called? 14. Counter-terror police investigated packages containing explosives found at Heathrow Airport, London City Airport and which London railway station? 15. Who was given a two-match touchline ban and fined £10,000 by the Football Association for confronting referee Mike Dean? 16. Crew and passengers were quarantined for four hours at Gatwick airport after a sickness outbreak on board a Virgin plane flying from where? 17. Luke Perry, best-known for his role in Beverly Hills, 90210, died after suffering a stroke. How old was he? 18. Ray Kelvin, chief executive of which fashion brand, agreed to resign over allegations of inappropriate behaviour? 19. Cycling champion Dr Rachel McKinnon said on Twitter: 'I guarantee that if we posted this photo and asked Do you think it's fair for this trans woman to compete in women's sport? a LOT of people would be screaming NO and calling her a man’. Who was the picture of? 20. Ralph and Jimmy Bulger lost a legal challenge at the High Court to overturn what? 21. Radio stations took Michael Jackson’s music from their playlists, a Simpsons' episode featuring the singer was pulled and a statue of him at a Manchester museum was removed after allegations were made in a documentary called what? 22. At least 23 people were killed when tornadoes struck which American state? 23. How did Michael Prasek die in his backyard in the village of Zdechov in the Czech Republic? 24. Former BBC DJ Simon Mayo led the line-up on which classical music radio station which started this week? 25. According to Forbes who became the world's youngest self-made billionaire? 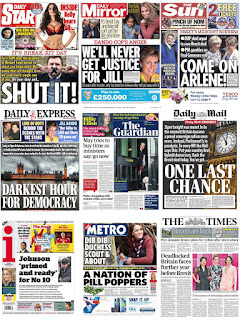 The top solo scorer in last week’s newsquiz was Janet Boyle with 20. The top team was Adam Batstone and Lucy Thorpe with 21, narrowly ahead of Bruce Hayward and Sarah and Jon Roberts and family both with 20. The Penmans scored an impressive 18 and Gavin Devine got 17.5. There is also a hat-tip to my Three Legs drinking pals Bryan, Heather, Peter and Stacey who scored 16. 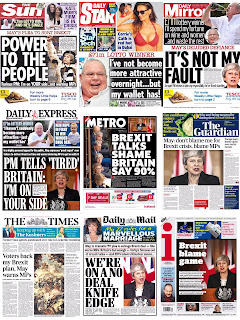 Here is this week’s newsquiz - as usual there are 25 questions about the week. Give it a go and let me know how you get on. 1. Prime Minister Theresa May told Parliament she wanted to reassure the House by making three commitments, including that there would be a second Meaningful Vote by what date 'at the latest’? 2. Labour leader Jeremy Corbyn responded to Theresa May’s statement by saying: 'The Prime Minister has become quite the expert at kicking' what? 3. What is the name of the MP who has been suspended from Labour after suggesting the party had 'given too much ground' to complaints of anti-Semitism? 4. George Eustice quit which Cabinet position over Theresa May's promise to allow MPs a vote on delaying Brexit if her deal is rejected? 5. Members of the newly formed Independent Group were photographed in which restaurant chain on Monday night? 6. Theresa May was videoed making an awkward shot after being challenged to a game of pool at the EU-Arab League summit by the prime minister of which country? 7. Actor Bradley Cooper and Lady Gaga caused a stir with their intimate rendition of which song at the Oscars? 8. What won Best Motion Picture Of The Year at the Oscars? 9. Donald Trump’s former lawyer Michael Cohen, in a testimony to Congress, said: 'I know what Mr Trump is. He is a ____. He is a ____. He is a cheat.’ What are the two missing words? Half a point for each? 10. The second North Korea summit between Donald Trump and Kim Jong-un, which ended early and without a deal, was held in which city? 11. Sally Challen, who killed her husband with a hammer, won an appeal against her conviction with her lawyers arguing that she was a victim of ____ ___ which became a criminal offence in 2015. What are the two missing words? 12. Why was 77-year-old George Pell in the headlines? 13. Two fighter jets were shot down after India struck 'a militant camp' in Pakistan in retaliation for a suicide bombing that killed 40 troops in which disputed territory? 14. A Premier League manager was sacked on Sunday and another on Thursday. Name both clubs. 15. Which company apologised after announcing a price rise which breached Ofcom's cap, designed to make a service ‘affordable' for all consumers? 16. Jack Letts, 23, known as Jihadi Jack, who was captured in Syria, said he wanted to come home because he missed pasties, Dr Who and what else? 17. French sportswear retailer Decathlon scrapped plans to sell what following a public outcry and threats of a boycott? 18. Who posted $100,000 bail that allowed him to go free while awaiting trial on charges that he sexually abused four people, including three underage girls? 19. What did football pundit Chris Sutton described as a ‘mutiny’, Alan Shearer as an 'astonishing incident’ and Jose Mourinho as a 'complicated situation’? 20. He was born in Berlin, had five wives including actress Mia Farrow, headed the London Symphony Orchestra for 11 years and won four Oscars. Who is he? 21. MP David Lammy questioned broadcaster Stacey Dooley's contribution to Comic Relief in Uganda by saying: 'The world does not need any more white ____.' What is the missing word? 22. Firefighters battled through the night to put out a large gorse fire on the highest peak of the hills in Edinburgh. What is it called? 23. The Met Office announced that the highest ever UK winter temperature of 21.2C was recorded at which London location? 24. The BBC has joined forces with ITV to launch a rival to US giant Netflix. What is it called? 25. 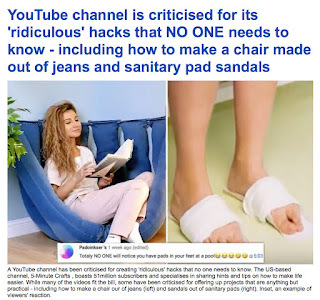 A sinister internet character that apparently set youngsters ‘challenges' involving self-harm was dismissed as being a hoax. What is the character called?